Jaen, Andalusia Spain is in the southern region of Andalusia just north of Granada. Jaen is in southern region of Andalusia just north of Granada. It is best known for its Renaissance architecture and superb olive oil with more than 40 million olive trees! However, there is so much to this intriguing city, not to mention its fascinating history. The most striking feature is the Santa Catalina Castle, which looks down over this beautiful provincial capital from a hilltop. The spectacular peaks of the Sierra de Jaen and Jabalcuz Mountains act as a stunning backdrop, and the winding streets that climb up and down the steep inclines towards the Castle are all part of its special charm. Around the time of Christ, Jaen was under Roman occupation and was named Aurigis because of its silver mines. 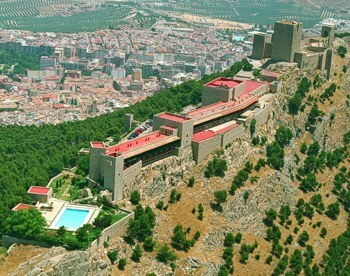 However, once the Moors captured the city it was changed to Jaen, which means stopping post on a caravan route. This was because important trading roads met in the city. In 1246 King Ferdinand III conquered the city and it then became a very strategic position on the frontier between Spain and Moorish Granada. It was a gateway for the armies launched by the King in his final assault to eventually capture Granada in 1492. The Castle fortress was built by the Moors in the 13th century, and was connected with the rest of the city by a secret underground passageway. King Ferdinand later extended the castle which enabled the Spanish to hold off repeated attacks by the Moors over the next two hundred years. 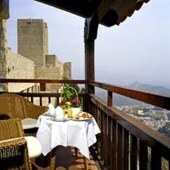 Today the Castle is the Parador Jaen (Hotel Castillo de Santa Catalina), a luxury four star hotel. Impressive arches dominate the main lounge with metal chandeliers and furniture that signify its historic background. Each bedroom has its own balcony with spectacular views that make it a very special experience. There is also an outdoor swimming pool for guests to enjoy during the hot, summer months. The Castle also has tours available, and the Centro de Interpretacion offers a 3D film explaining the history of the building. Visitors also have an opportunity to visit the well preserved prison cells and cistern. Another very special building in Jaen is its Renaissance Cathedral. Behind the high alter is the famous cloth said to have been used by St Veronica to wipe Jesus’ face as he carried the cross to Golgotha. Legend has it that a woman following Jesus removed her veil to wipe his tears and the imprint of his face stayed on the cloth. However, as Rome claims to have the very same cloth I suppose no one will know for certain who has rightful possession. But the locals of Jaen claim the secret lies with them. Another incredible site to behold is the 11th century Arab baths below the Villardompardo Palace. They are in fact the largest baths in Spain open to the public and it is thought they were built over earlier Roman baths. In the basement of the palace you can actually see the Roman ruins through a glass walkway. Jaen is definitely not to be missed and all the more exciting if you are there during one of the numerous festivals held throughout the year. Should you choose to combine it with a few days in Granada, this combination will guarantee to be a fascinating historical experience.